Rush University Medical Center’s Road Home Program is providing veterans of the United States military with an innovative option for treating post-traumatic stress disorder and other mental health conditions related to their service. The program fills gaps in government-provided mental health care for veterans whose trauma-induced mental health issues might otherwise go untreated. Brennan recently completed five years of active duty that included several months counseling soldiers hours after they were in combat in Iraq and Afghanistan. He knows that for many combat veterans, psychological and emotional wounds can linger for years. Many are able to receive care at Veterans Affairs hospitals, but thousands do not. The Road Home Program, also known as The National Center of Excellence for Veterans and Their Families at Rush, provides military veterans and their families with confidential support, counseling and health services. Specialists can help with a full range of veterans' issues, including post-traumatic stress disorder, traumatic brain injury and military sexual trauma. Road Home’s Intensive Outpatient Program provides groups of eight to 12 veterans with more than 100 hours of specialized mental health services in just three weeks. The program was established with funding from Wounded Warrior Project, a national nonprofit veterans service organization based in Jacksonville, Florida. Since the intensive outpatient program, nicknamed "PTSD boot camp," was launched early this year, 34 veterans already have completed a three-week therapy program. Concentrating therapy over consecutive days can greatly improve outcomes, and integrating established, evidence-based medical approaches with innovative techniques based on recent research into the biology of trauma provides more tools for therapists. The program’s Monday-through-Friday, full-day regimen includes individual and group therapy, family education and counseling, psychiatric care, wellness and integrative medicine. The program also incorporates therapies such as yoga, art therapy, meditation and even virtual reality exposure therapy. 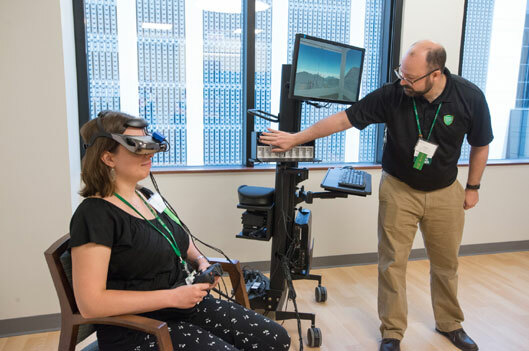 To provide this treatment, clinicians at the Road Home use three-dimensional computer simulations to expose veterans to the sights, sounds, sensations and even scents of the events responsible for the patients' trauma. In a safe, controlled setting, repeatedly exposing people to simulated events such as a roadside ambush or bombing can help retrain brains to overcome fear. These specialized services are delivered as part of Warrior Care Network, a Wounded Warrior Project-funded national network of four academic medical centers that connects wounded veterans and their families with world-class mental health care at no cost and without regard to their geographic location. The other hospitals in the network are Emory Healthcare, Massachusetts General Hospital and UCLA Health. The VA estimates that up to one in five of the 2.3 million American veterans who served in Iraq and Afghanistan will suffer from post-traumatic stress disorder at some point. Although the VA has undertaken significant efforts to expand services and capacity to meet the growing mental health needs of veterans, thousands go untreated. Private sector efforts are playing an important role in the shared mission of serving the men and women who served in the military. “The Road Home Program works in collaboration with the VA, not in competition. We have a collective goal, which is to provide a high standard of care for a deserving population — veterans,” Brennan says. The intensive outpatient program's consecutive days of treatment also allows clinicians to put into practice the growing body of clinical research in the biology of trauma-based disorders. While the mental and emotional trauma soldiers suffer has been observed for centuries, recent clinical research into these “invisible wounds of war” allows therapists to better understand the biological processes of trauma. The human nervous system has developed specific physiological actions — the fight or flight reaction — that help temporarily boost our physical and mental abilities either to escape or to contend with life-threatening situations. For people that suffer from PTSD, certain sounds, sights or smells act as sensory triggers that re-activate the fight or flight reaction. The fundamental goal of treating PTSD is calming the body. Therapist-guided discussions, a treatment known as cognitive processing therapy, help patients better understand what has triggered a state of anxiety and in turn helps them better control negative thoughts. In addition, psychotropic drugs reduce anxiety by calming the body medicinally.